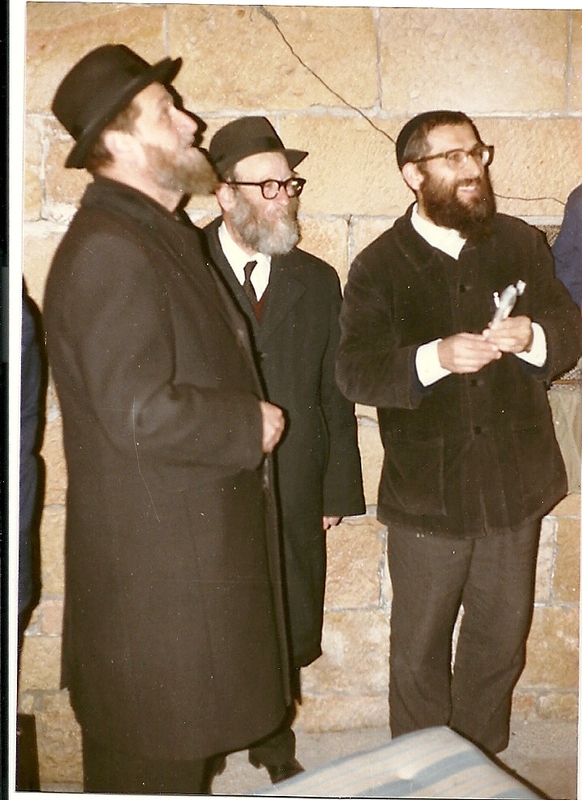 A great Talmid Chacham, Ha-Rav Eliyahu Yosef Shear Yashuv Cohain has ascended on high. He is the third Cohain Ha-Gadol, after his father, the Nazir – Ha-Rav David Cohain and after Maran Ha-Rav Kook, who also ascended on high on the 3rd of Elul. He himself merited learning Torah from Maran Ha-Rav Kook as a child, and spent much time in his home. He was 7 years old when Rav Kook passed away. We, the lowly, are unable to understand the level of a person who merited to meet Maran Ha-Rav Kook and to be perfumed by his holiness. He also merited learning much from Rabbenu Ha-Rav Tzvi Yehudah, hours upon hours of private conversations. Ha-Rav Shear Yashuv was a great and loyal student of his Rabbis, and connected deeply to the great vision of the "revival of the Nation in its Land according to its Torah". His father decided that he would also be a Nazir from the time of his birth, but allowed him to cease being a Nazir when he so desired. When Ha-Rav Shear Yashuv turned 16, he decided to cut his hair but continued to refrain from drinking wine. He also had additional customs, such as refraining from meat and fish, and only wearing canvas shoes, until he was wounded during the War of Independence. And here we turn from the Torah learner, the Shakdan, to the soldier. He was among the members of the underground group "Brit Chashmonaim" who fought against the British rule, and was among the founders of the "Fighting Yeshiva": 8 hours of Torah learning, 8 hours of guard duty and 8 hours for one's physical needs. Ha-Rav Shear Yashuv related that during the War of Independence there was a major dispute between Rabbis – including within Yeshivat Mercaz Ha-Rav – about whether Yeshiva students should be drafted into the military. The students followed the path of our Rabbi and the Nazir and were active in the Haganah, Etzel and Lechi. During the waiting period, after the UN votes and before the end of the British Mandate, Ha-Rav Shear Yashuv would learn in the Yeshiva. One day he left the Yeshiva and saw a broadside with the huge title that Maran Ha-Rav Kook opposed drafting Yeshiva students into the army. It included harsh quotes from one of Rav Kook's letters regarding this issue. He was unsure what to do and was deep in thought when he bumped into our Rabbi. Our Rabbi immediately noted his distress and said: "Shear Yashuv, what happened? Why are you so upset and pale?" He told him what he had seen and pointed to the broadside. Our Rabbi roared over and over: "This is a distortion! This is a total distortion!" After he calmed down, he explained that these quotes were taken from a letter of Maran Ha-Rav Kook to Rav Dr. Hertz, Chief Rabbi of England, regarding being drafted into the British army, which the latter presented to the government. Yeshiva students who arrived in London from Russia and Poland as refugees of World War One and were learning Torah were left off the list of those exempt from military service (for example, priests, who were exempted). Maran Ha-Rav Kook admonished him, and said that this has nothing to do with the war for Jerusalem (Igrot Ha-Re'eiyah vol. 3, letter #810). Rav Shear Yashuv encouraged and helped our Rabbi to publish a booklet clarifying this issue (see Le-Hilchot Tzibur #1). During the difficult battle for the Old City in Jerusalem, the Jewish community was defeated and Rav Shear Yashuv, who was badly wounded on his leg, was taken into Jordanian captivity along with other surviving fighters. He thus did not merit seeing the publication of the booklet he initiated. After approximately eight months and the establishment of the State, Rav Shear Yashuv was released and taken to Zichron Yaakov for rehabilitation. Within a day, at a time when buses were rare, our Rabbi appeared outside his window. He entered the room, hugged and kissed him and burst out crying. He removed a small booklet from his pocket and gave it to him. It was the first booklet printed, and was dedicated to Rav Shear Yashuv (The booklet was printed in Le-Netivot Yisrael vol. 1 #23). When Ha-Rav Shear Yashuv was serving as a Rabbi in the Army, he came to his own wedding in Yerushalayim dressed in his Tzahal officers' uniform. Some people from the Yishuv Ha-Yashan did not look upon this positively. Rabbenu Ha-Rav Tzvi Yehudah was surprised by their reactions, "Wearing the clothing of a Russian nobleman - this is appropriate?! But wearing the uniform of Tzeva Haganah Le-Yisrael - the Israel Defense Force - this is not appropriate?!" (Sichot Ha-Rav Tzvi Yehudah – Eretz Yisrael p. 268. Tal Chermon – Moadim, p. 135). Rav Shear Yashuv was an accomplished person. It is difficult to believe how much he did, and with such calmness and love: he was the head of Torah institutions, earned a law degree, was a researcher of Mishpat Ivri, an assistant mayor of Yerushalayim, and much more. And finally, he became the Chief Rabbi of the Holy City of Haifa. In this position, it pained him that Ashkenazim in the Galil and Northern Israel did not recite Birkat Cohanim every day. He wrote a Teshuvah to reestablish this practice (see Shai Cohain #1). When I served in Kibbutz Lavi in the Lower Galil, I asked him about this practice. I obviously was not brazen enough to make such an important change, I therefore said that in addition Shabbat, we should also Duchan on days on which we recite Musaf. Later, when I served in Moshav Keshet in the Golan, I instituted Duchaning everyday according to his path, since it was a new place. Ha-Rav Shear Yashuv was once invited as an honored guest to Kibbutz Lavi, and he was gracious enough to visit my home. When he saw that I was wearing a simple shirt and pants like all of the other Kibbutznikim, while he was wearing a long coat and hat, he looked at me, and said humbly while rubbing his clothing: "These are my uniform", i.e. I shouldn't suspect that he was craving any honor. And he was a truly humble person. He loved everyone from every stream and everyone loved him. This is how he always was, beginning in Jordanian captivity and ending in the Holy City of "Red" Haifa, as people once called it on account of its lack of Torah. He was a man of Torah and peace. He was truly a student of Aharon Ha-Cohain, as the Mishnah described: loving peace and pursuing peace, loving people and bringing them closer to Torah" (Avot 1:12).